5 Tips for Less Stressful Race Training | Eat. Blog. Run. I’ve been wrestling with toddler-induced plague for two weeks now but, knowing that I have a 10K at the end of June –and because I always feel better when I exercise — I’ve kept running. Last weekend while I was in the height of feeling like crap, I hit the number of minutes I wanted to run (45), even though I was mentally prepared to not hit that target. And it wasn’t onerous. In fact, I loved the idea that toxins were pouring out of my body with each passing minute! After that run, I realized that my current approach to running has served me really, really well. 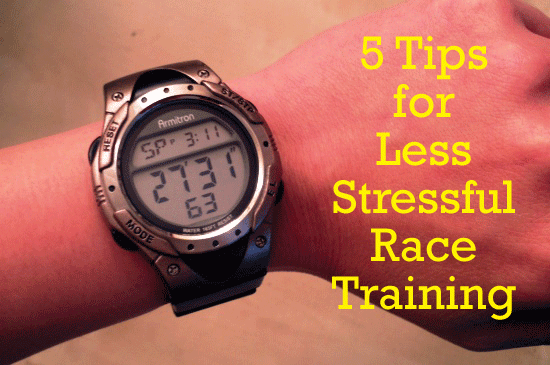 Today I wanted to share my 5 tips for less stressful race training. 1. Start now, even if you don’t have a race on the books. When I first started experimenting with running, I loved the Couch to 5K plan; probably because the segments were short and doable. However, every time I have looked at 10K and half marathon training plans, I feel completely daunted. I mean, I totally understand the need to prepare properly, but these plans look so regimented, and with no degrees of freedom to account for things like toddler induced plague or work travel. So, I recommend getting into a running routine now to build your general fitness and endurance, even if you don’t have a race on the books — the below recommendations will flesh out why. 2. Remember that short runs count. I once read in a running magazine that 10 minutes of running is better than nothing. That recommendation has always stuck with me; in fact, it’s similar to what I used to tell my violin students (5-10 minutes practice a day is better than an hour the day before the lesson). 3. Build runs into your everyday tasks. I have two kids and I work full-time. Time is pretty tight. On the weekdays, it’s easiest for me to work in fitness if I’m on my way somewhere, these days in the form of transporting Violet to day care. I walk her in the jogger (20 minutes) to wake up my legs and run home (or a longer loop to home). 4. Go for consistency. Consistency is the key, and will be supported by #1, #2, and #3 above. I usually run 3-4 weekdays, via the Violet-to-daycare approach + one weekend day. After the slushy winter roads cleared a few months back I spent one month simply walking Vi to school (20 minutes) and running home (11-12 minutes) and on the weekend I would do a 20-30 minute run. The next month I upped my weekday runs to 20-30 minutes and my weekend run to 30-40 minutes. This month I’ve been trying to keeping my weekday runs in the 25-30 minute range and upping my weekend runs (so far to 45-50 minutes) in anticipation of the 10K on June 30. 5. Be flexible. The reality is this: some days you will have the plague, some days the weather will be against you, and some days your legs just won’t carry you. Instead of feeling bad about these things, change your mindset and be flexible. For example, I have had days where I’ve gone out intending to run for 30 minutes and just felt like crap; I keep #2 in mind and even if I can only run 10-15 minutes, I do it and celebrate the fact that I did something. Or this week two of my weekday runs (including today) were deterred by downpour. So, instead I did yoga, which in my opinion is the best way to stretch and prevent running injury. I’m actually now feeling well positioned for a nice longer run tomorrow. I cannot say enough how well the short, consistent, and flexible approach to running has worked for me. Based on my ability to run 45 minutes with the plague last weekend, not only is this approach clearly helping with my general fitness and endurance, but the approach is fun and not stressful; I don’t feel horrible that I’m not checking off a specific box on a specific day yet I’m still pretty certain I’ll be properly trained up for the 10K. I’ve got two more weekends to experiment with longer runs (hopefully, 55-60 minutes this weekend and 60-65 the next…but I will retain a flexible mindset!) before the 10K and I’m feeling good. If all goes well with my approach, I’m thinking that I want to extend this approach and take the plunge and sign up for a half marathon!